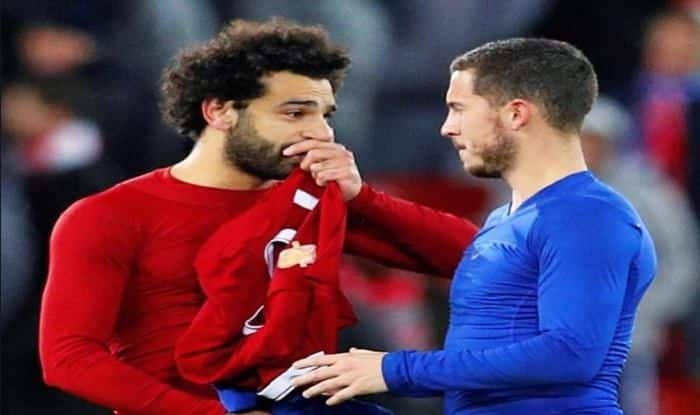 Eden Hazard has hailed his former teammate Mohamed Salah for achieving an impressive form in the last couple of season. Once teammates at Chelsea football club, Eden Hazard and Mohammed Salah — two of the finest wingers in Premier League — are now rivals as the latter plies his trade with Liverpool. In the past couple of years, Salah’s meteoric rise has captured the imagination of his counterparts from various teams, hazard admittedly being one of them. While the Belgium was being touted as the next best who could potentially reach the levels of Messi and Ronaldo, Egyptian international Salah, once a Chelsea reject, has taken the football world by storm since joining Liverpool in the summer of 2017. Mohamed Salah’s contribution in terms of goal and assists is simply stellar. In last year’s campaign, he won the golden boot, the Premier League ‘Player of The Year’, the ‘African Player of The Year’ and the Golden boot. The rise of Mo Salah has given the critics a measure to compare the stagnancy of Hazard’s form. The Chelsea man has lacked composure in front of the goal and have not had the numbers to justify is comparisons to the likes of Messi and Ronaldo. In an interview, Hazard admitted that he wants to achieve Salah’s level. This season, the Egyptian is again firing on all cylinders and is currently second on the League’s top scorer list, just one behind Man City’s Aguero. He will aim to aid his Liverpool side to the Premier League title for the first time in over two decades. meanwhile, Hazard has been strongly linked with a move to Real Madrid.